1. Mix cake mix, shortening or butter, and eggs together. Batter will be thick. 2. Roll into one inch balls and place on cookie sheet. 3. Bake at 425 degrees for 4 minutes on the very bottom oven rack and then 4 minutes on the very top rack. 4. 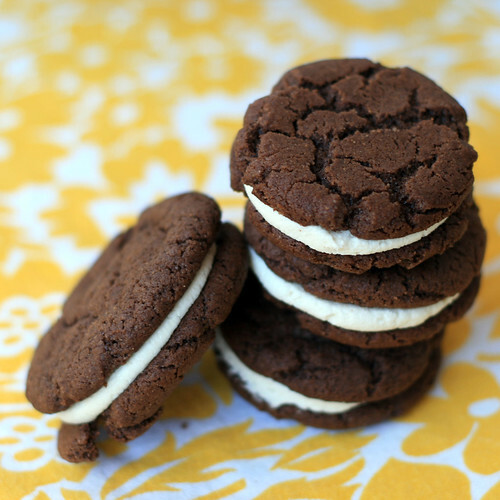 Cool and then apply a generous amount of cream cheese frosting between two cookies. Now you have the yummiest cookie ever! *Tip: I store these cookies in the refrigerator. Helps the frosting to stay a little more firm and the cookie chewy. Soooo good. I do have a fabulous recipe for homemade cream cheese frosting that I would be happy to post for you.